I first got in touch with Dennis Over through the Lancaster Archive Forum a few years ago, on which he is a much-loved and highly prolific member. Dennis began the war, too young to join the forces, working on fitting out air-sea rescue launches. Once old enough he joined the RAF as aircrew, serving on 106 and 227 Squadrons as a rear gunner. Following the war he was station manager at Heathrow for first BOAC and later for British Airways. Consequently Dennis has a wealth of stories. 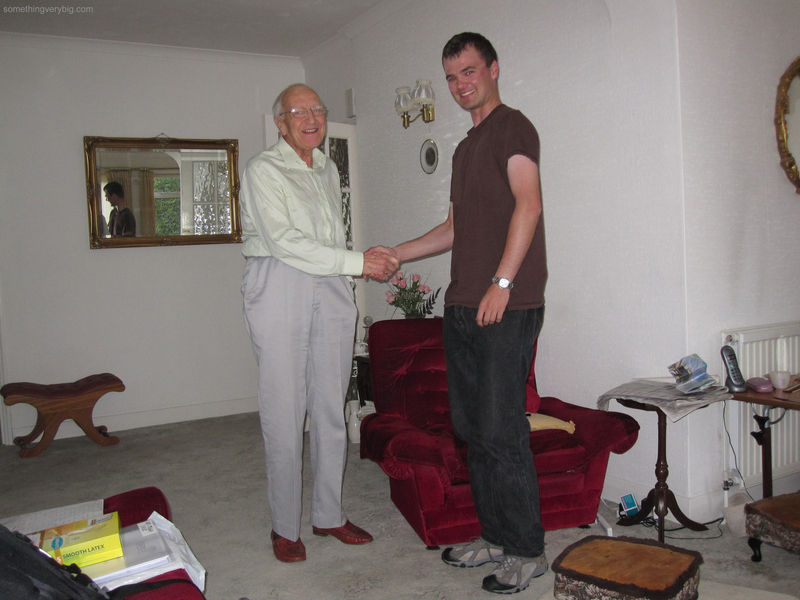 I therefore couldn’t miss the opportunity when I was in the UK in 2010 to meet him and his wife of 66 years, Peggy, at their home in London. We talked for hours and hours and hours. We spoke about Concordes. We spoke about Queen’s Tours, L1011s and B707s. We discussed Dennis’ unconfirmed but more or less definite claim for a nightfighter. We talked about air-sea rescue launches, Comets (exploding or otherwise), Constellations, RAF dinghies, Irish jokes, 5th pods, cheese and rocket-powered sailplanes. And of course, we told stories about Tiger Moths. As a rear gunner, Dennis told me that he felt a real sense of isolation. He was physically removed from the rest of the crew and, of course, was the only one flying backwards. He said he never felt any panic or fear while on operations. That came either before or after. While actually flying he felt only a sense of complete concentration on his duties, for the mutual benefit of his entire crew. He did mention a feeling of unreality, almost of detachment, as if he had been viewing the events he was describing from the position of a third party. Partly at least, I imagine this was a means of dealing with the enormity of the situations he found himself in. The conversation was wide-ranging and ever changing. At one point I used his telephone to ring the family I was staying with in London and tell them I wouldn’t be home for dinner. This discussion was far too good to cut short! I always love talking to veteran aircrew. They are a living link to the past. While I can learn facts from official documents and get a personal picture from reading letters and diaries, oral history is far more interactive. It is subject to the limitations of memory, but when supported by other sources a witness account can add much colour to a history. Dennis has some fantastic memories and it was a real pleasure to drag the hangar doors open and listen in some awe for a few hours. Scattered across the fields of England are the remains of hundreds of former military aerodromes. Some have disappeared entirely, the runways excavated for hard fill and the buildings demolished. Some have been turned into business parks, showgrounds, residential estates and even prisons. Some have reverted back to agricultural land, with pig or chicken sheds where once were runways. A scant few are still operational airfields, civilian light aeroplanes replacing the bombers. And many more have simply been mothballed – still owned by the Ministry of Defence but all but abandoned, externally intact but uncared for, quietly decaying away to dust. One such airfield is RAF Bicester, and a group called Bomber Command Heritage is determined to save it. Bicester, at least according to English Heritage, “retains – better than any other aviation site in Britain – the layout and built fabric relating to both the first expansion period of the RAF and subsequent developments up to 1940”. While not an operational front-line Bomber Command station, Bicester was home to 13 Operational Training Unit, part of the great training pipeline which kept those front-line squadrons supplied with aircrew. The all-grass flying field is still used by gliders of the Windrushers Gliding Club. Bomber Command Heritage sees an opportunity to preserve the site by turning the disused Technical Site into a significant museum. On the face of it, it’s a fantastic idea. But it’s a large site (348 acres). Just purchasing the site from the MOD is expected to cost upwards of £2 million. There are also a large number of buildings on the site, some of which, the hangars in particular, are quite large. Many are in an advanced state of disrepair. Restoring the buildings is estimated to cost about £35 million, a lot of money for a volunteer organisation to come up with. And once they are restored, the costs involved in maintaining an active aerodrome and keeping the buildings in good repair are also not inconsiderable. It’s likely that gate takings alone from what would be, let’s face it, a niche market of Bomber Command enthusiasts would be insufficient to keep the museum open for long. There is always the possibility of lottery grants and other government support, but to rely on these as long-term funding appears less than sustainable. So how could a site like Bicester be saved –with space for a significant museum on site – but still be a going concern in its own right? There needs to be something else other than just the museum to make the site commercially viable. ‘Developers’ have become a dirty word in today’s society with their ‘knock down and rebuild it bigger better and newer’ disregard for history. But development doesn’t have to be incompatible with heritage. On the northern head at the entrance to Sydney Harbour lies the old Quarantine Station. It’s a magnificent site with many extremely significant buildings, used between 1832 and 1984 to quarantine passengers from arriving ships affected by infectious diseases. After its closure as an active facility the site passed into the management of the NSW Parks and Wildlife Service. NPWS did considerable work to the site to care for it (and conducted fantastic ghost tours, one of which I well remember going on in the mid 1990s) but they never had the funding required to ensure that the site was preserved properly. Things came to a head in 2002 when the 180-year-old hospital building burnt down, a fire thought to have been caused by an electrical fault. Shortly afterwards it was decided that government funding by itself was not enough to properly care for the site, and that private development was a possible solution. Unsurprisingly there was considerable public protest towards the idea, but – now that the site has indeed been leased to a private operator and has been reopened as a boutique accommodation, function and conference venue with a museum and guided tours – it’s actually turned out quite well. The commercial activities generate an income which supports the upkeep of the site, while being sympathetic to the heritage of the old station. The buildings are restored to their former glory. Even the old hospital that burnt down has been completely rebuilt, from scratch and using period methods, into a faithful and quite spectacular reproduction of the old building. Government funds alone would never have been sufficient to cover the work at the extraordinarily high standard required. Most importantly, the site retains the ‘feel’ of the old Quarantine Station – the work carried out has remained sympathetic to the original buildings and the activities that now take place there are compatible uses for them – and the public still has access to the site to be able to enjoy, appreciate and learn from it. The site is still alive. I use the Quarantine Station simply as an example of what I think is a well-thought-out, sympathetic and viable use for a historical site. I’m not advocating that RAF Bicester is turned into a ‘boutique accommodation, function and conference centre’. But despite having all the best intentions, sentiment alone will not provide the cold hard cash that’s needed to acquire and restore a large site like a historic airfield. There needs to be some sort of income generating activities in place if the site is to remain viable, beyond just a museum. Imaginative and creative – and commercially viable – uses for significant historical sites are not necessarily incompatible with the idea of preserving the heritage value of them. There need to be carefully thought-out controls in place to ensure that any development remains true to the heritage of the site. But developers are not necessarily the enemy, if they have the funding that will make the difference between the site falling further into disrepair, or it remaining in the long-term as an example of a Bomber Command airfield.